That is what Ian Blochwitz learned this summer. Blochwitz, a sustainable energy management major who will graduate in fall 2017, spent nearly three weeks in Stockholm, Sweden, where he interned at Plantagon International AB, an urban agriculture company. The self-designed internship was made possible through the Rosen Undergraduate Fellowship, which is supported by the Florence and Robert A. Rosen Family Foundation. Blochwitz began the application process in January. "I've been interested in this company for a long time," Blochwitz said of Plantagon. "The Rosens read what I wrote (in the fellowship application) and believed in what I wrote … they felt comfortable supporting a student with some aspirations … that made me feel justified." 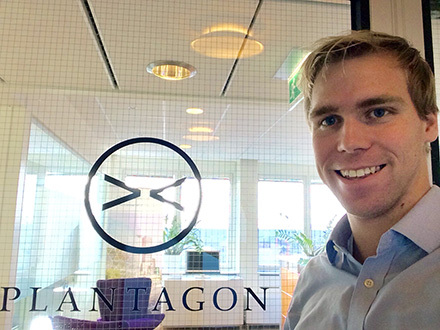 Roughly seven months and a 10-hour plane ride later, Blochwitz was in Stockholm for a dream internship at Plantagon. Plantagon is dedicated to developing solutions for large-scale food production in cities, according to the company's website. One reason the company stood out to Blochwitz is that it was founded in part by the Onondaga Nation, part of the Haudenosaunee Confederacy, south of Syracuse. "They work together to build different sustainable enterprises," Blochwitz explained. "Specifically the greenhouse - a 16-story vertical greenhouse is something that they are designing." The greenhouse gives the company an opportunity to grow food without competing with local farmers. This is where the idea of "agritechture" - a combination of agriculture, technology and architecture - comes into play. Agritechture involves incorporating design, and knowledge of plants and energy systems into one sustainable building, Blochwitz said. Blochwitz was able to tour the facilities and learn about the energy systems used at Plantagon. He learned that food tastes better when grown in sunlight rather than under the glow of LEDs. He also met with several Plantagon employees who explained how the company operates. "I was able to meet one of the founders," Blochwitz said. "I spent time with him, talking about his goals and his background." While speaking with employees, Blochwitz found himself applying knowledge he gained from classes at ESF. "It was very relevant; I could have a conversation with someone in the industry because of my classes," he said. "I decided to attend ESF because of how serious the programs are. The sustainable energy management major is only a few years old and ESF brought on two new professors to help teach courses. I feel like the investment ESF made into the program made it worthwhile." During his time abroad, Blochwitz was not only immersed in a world of sustainable enterprises, but in Swedish culture as well. He said he underestimated how different the country would be from home. "I wore a tie the first day," Blochwitz recalled. "And nobody wears a tie." He noticed how polite everyone was and brought this up to the employees at Plantagon. They explained that it is the result of a cultural ideal known as the Law of Jante. "It's these 10 rules … that talk about how nobody is better than anyone else, and that you can't think that you are better than anyone or that you know more than anyone," Blochwitz said. "It creates a homogeneous unit, which is really unique." Blochwitz attributes his internship experience to his newfound comfort and confidence with being in a business setting. He hopes to carry this into the future and one day manage different energy systems.